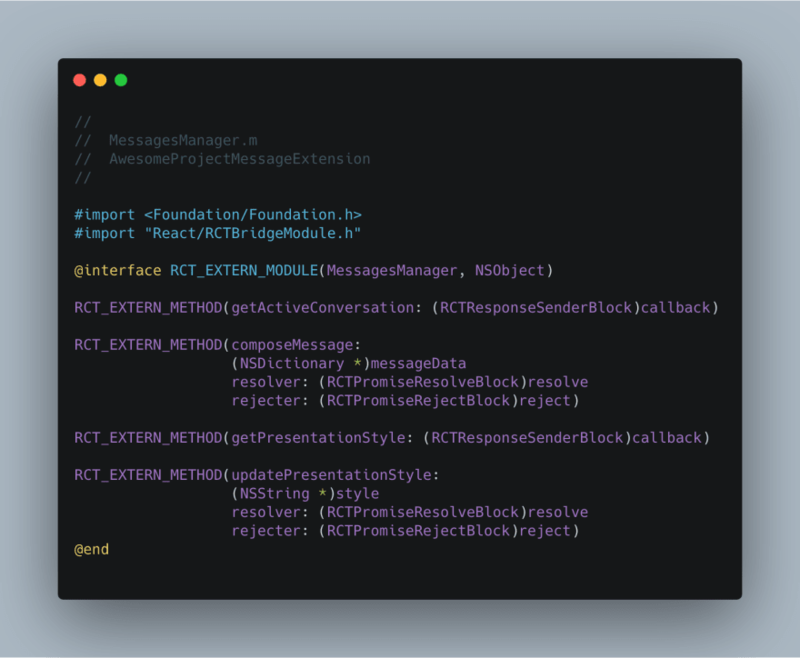 When we set out to build an iMessage extension for Lisk Mobile using React Native, we immediately hit an exciting challenge. As it turns out, when it comes to third-party applications, Apple likes developers to play by its own rules. If a company wants to benefit Apple’ new features of the tech giant’s operational systems and rich user base, it needs to be built using Apple’s own tools and programming language. iPhone’s iMessage is definitely worth this hassle. It has proven to be a big hit since its release in 2016. Within the first six months, iMessage has generated thousands of innovative in-messenger extensions including those created by Airbnb and Dropbox. Late in 2018, Mark Zuckerberg admitted this feature is one of Facebook’s 'biggest competitor by far'. Since the release of Lisk Mobile during Lisk’s Berlin meetup in October 2018, our team has been busy implementing features such as Face ID Authentication, as well as developing blockchain-specific solutions. Identifying the opportunity to extend the iMessage option for our users, we got to work on our own integration. Here’s the end product! Want to implement this for your app? Then read on. If you want to know more about Lisk first, check out this short explainer clip, our product page, or our documentation! The problem: there was no up-to-date documentation to create an iMessage extension using React Native. 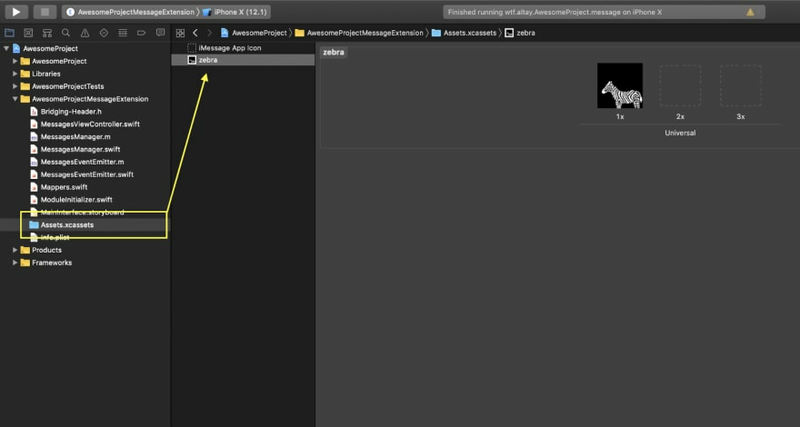 The first option was to look for existing React Native component and educational material. Unfortunately, we could not find official documentation or up-to-date resources due to the fast pace of change in both React Native and native iOS development. The second option was to try native iOS development within the Lisk Mobile codebase. The benefit of this approach was example projects and conference talks provided by Apple. However, introducing a considerable amount of Swift or Objective-C into the codebase was not desirable. Such a move would cause too much code duplication due to us having to rewrite most of our existing business logic and UI components. The solution: we wrote our own bridge implementation and documented the process. First things first! Let’s start by creating a brand new React Native application. Since we are going to use native features, it would be better to follow the related part of the official documentation that suggests using the react-native-cli. 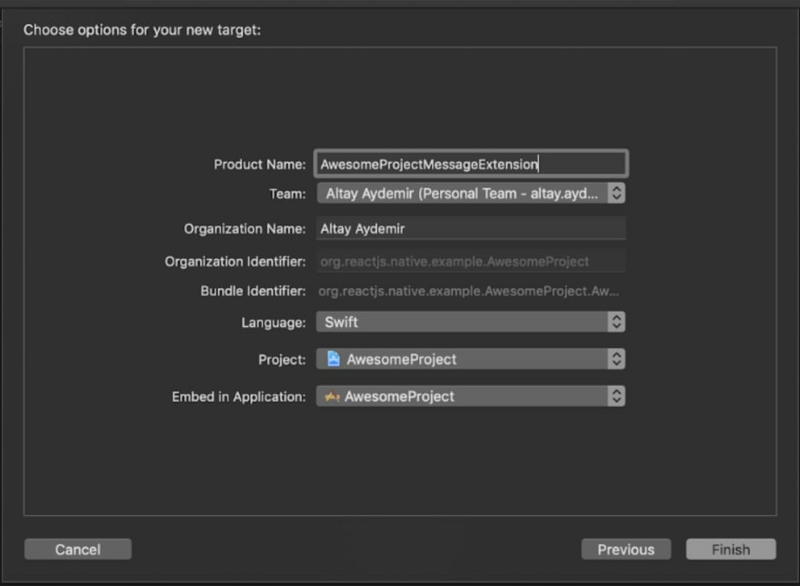 Then let’s create a new project called, of course, AwesomeProject! The next step is to add a target for our Xcode project that covers the iMessage extension. 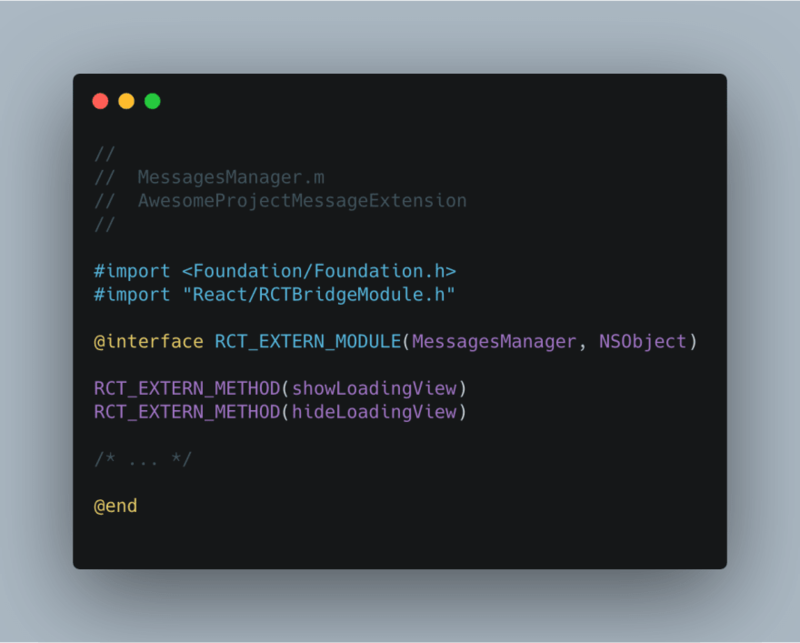 Now that we have our Xcode target for the iMessage extension, it’s time to create a blueprint for our root component on the React Native side. We also need to register that component in order to access it easily in the following steps. 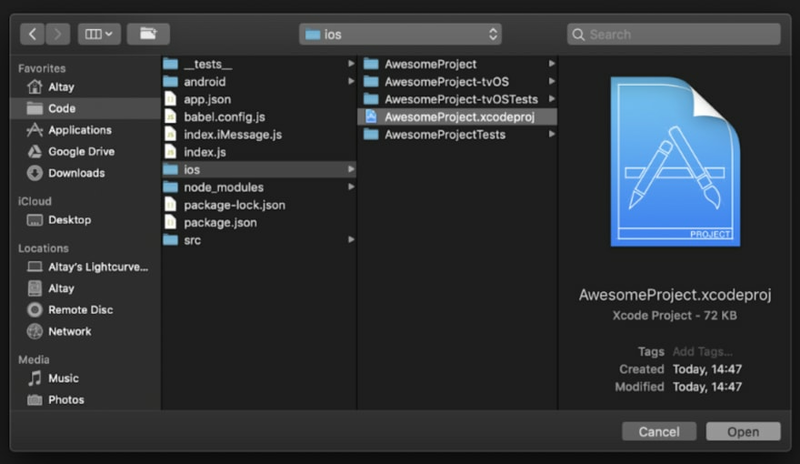 Let’s create another file in the project root similar to the one React Native creates for the main application. At this step, we will update our iMessage target to have the capability of rendering a React Native application within a native one. In order to achieve this, we have some manual work to do. In a regular React Native application, this step is actually handled automatically by the boilerplate that we have from react-native-cli, this is the case for Lisk. 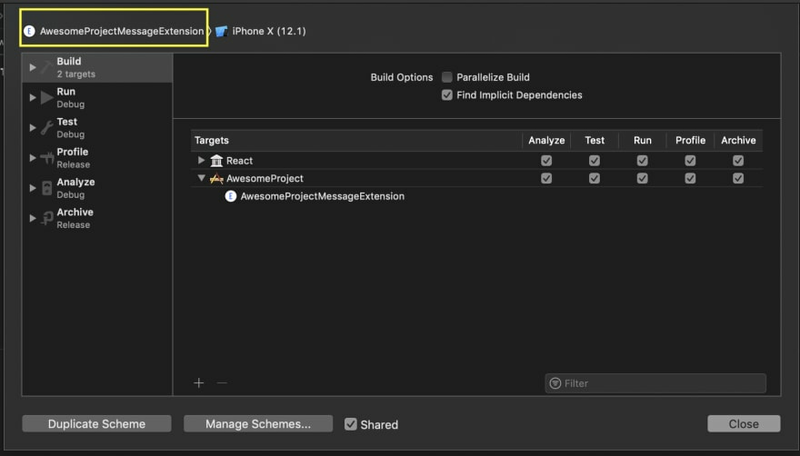 If you feel something is missing, you can compare the configuration and structure of your iMessage extension target with the main application. We will start the configuration by linking the React related libraries. Since it’s meant to be a simple application, libraries we add are just the core ones we need at the moment. If you are using some third party modules on your main application and also need them in your iMessage Extension, don’t forget to link them here as well! Now that we have made those libraries available for our native part, it’s time to create a Bridging-Header file make them recognizable for the Swift compiler. 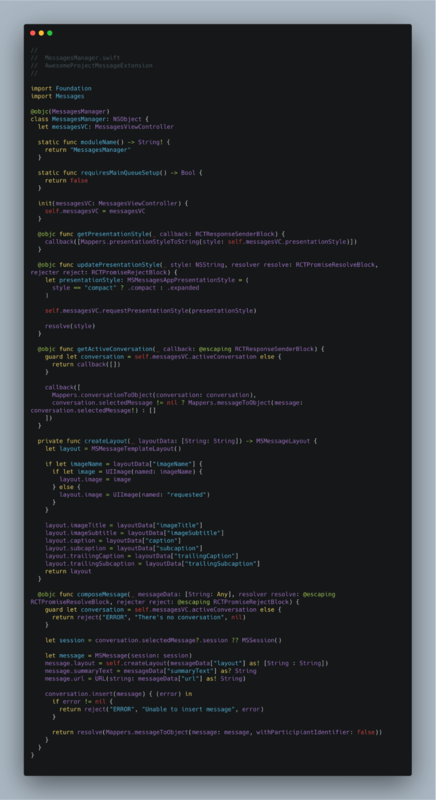 The reason behind this is the libraries we have linked on the previous step are written with Objective-C. This has been a common approach since Apple introduced Swift as the new language of the iOS platform and you can obtain deeper knowledge about it here. 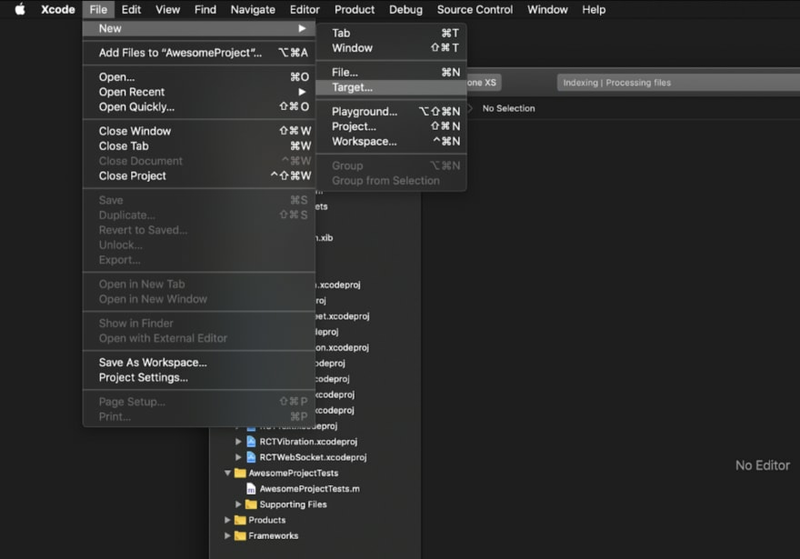 We start with creating a new header file called Bridging-Header.h inside AwesomeProjectMessageExtension folder. 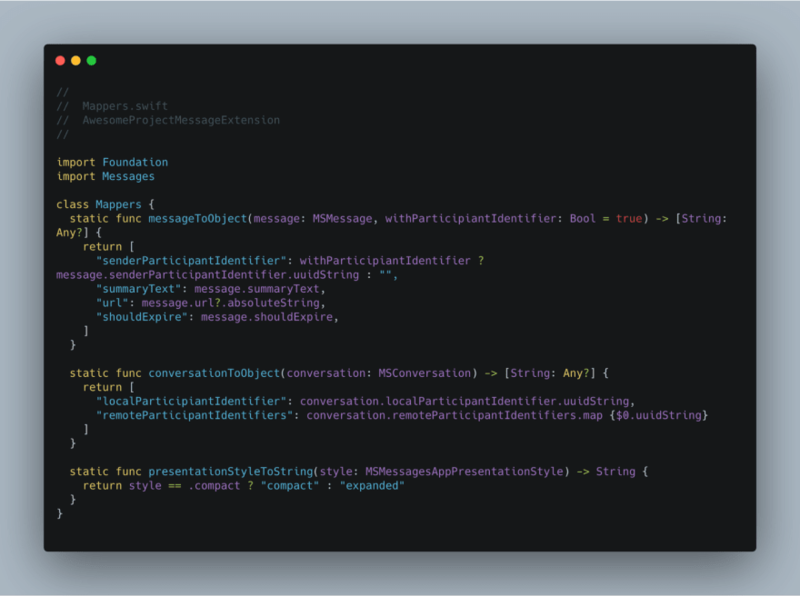 Next, by navigating to Build Settings / Swift Compiler — General section of the Xcode configuration, choose that file as the Objective-C bridging header. The first one is updating Info.plist, a configuration file placed in every iOS project. In order to make our React Native bundle accessible in development mode, we need to enable loading content from localhost. The next step is to add a Build Phase for iMessage extensions target in order to make sure we trigger the build script of React Native when we are running the extension. The last step for this section is to update the schemes of the project. 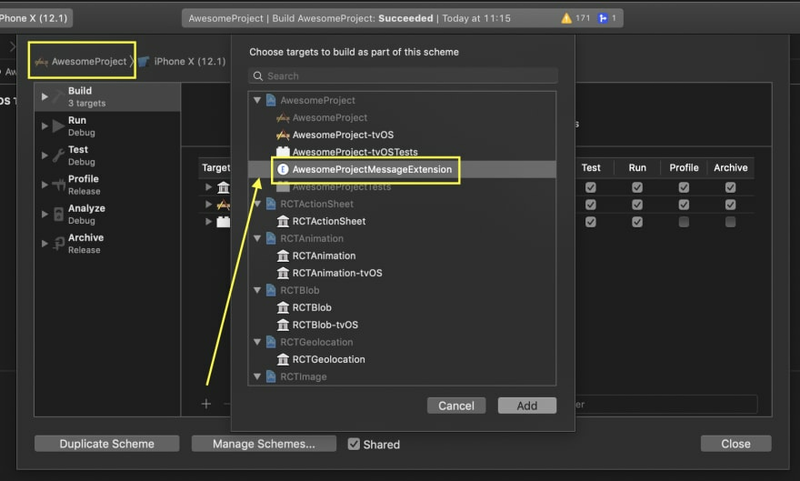 Each target in the application has a scheme that defines the configuration for actions available within the context of Xcode like Build, Run and Analyze. We update the schemes of both the main application and iMessage extension to make sure we have all the required content while preparing the app for the release. 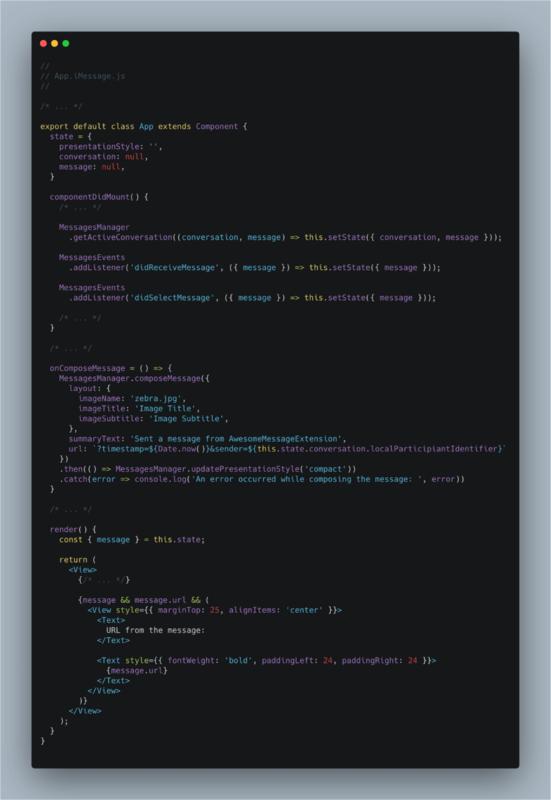 Now that we are pretty much done with the configuration, it’s time to start building our structure to render the application we have registered in the Create iMessage Root on React Native Side section. 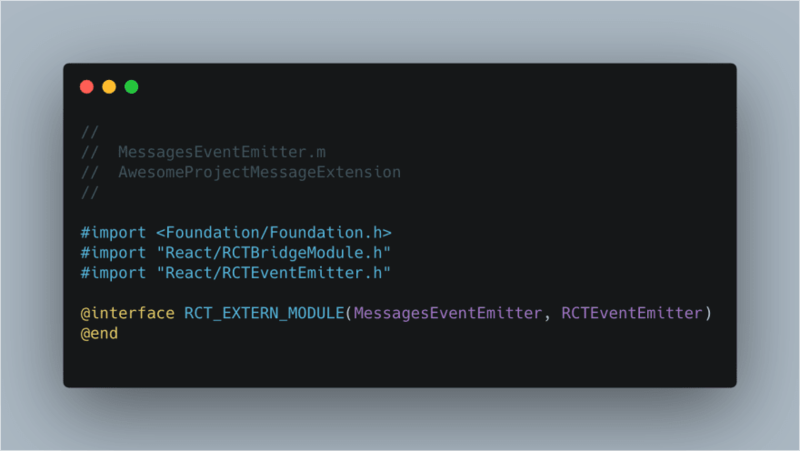 First, let’s take a quick look at the structure of the iMessage extension. Every iMessage Extension has an entry point called MSMessagesAppViewController which extends the UIViewController class from UIKit and contains lifecycle methods and properties of an iMessage extension instance. This is similar to the AppDelegate in our main iOS application but doesn’t have all the capabilities of it. 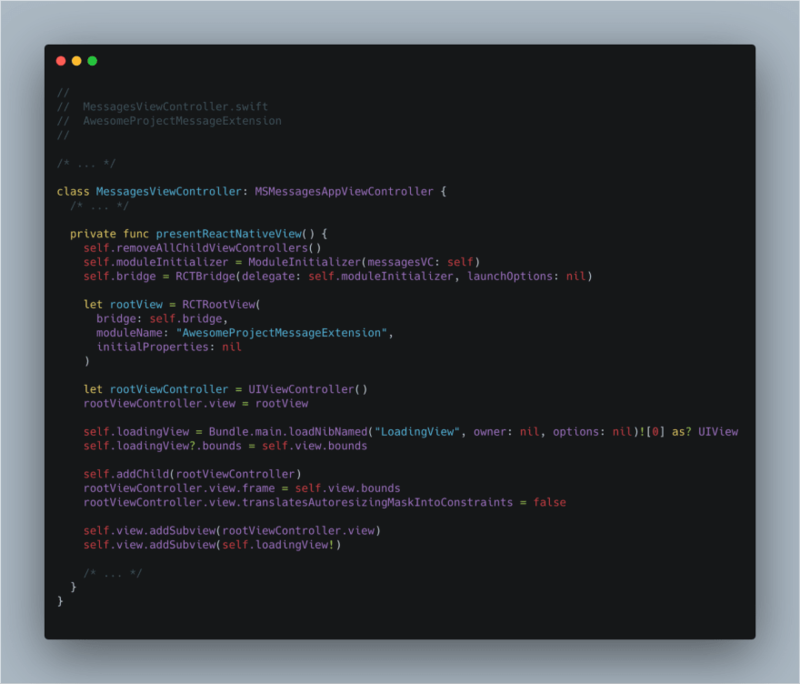 What we focus on at this point is to find a suitable way to create our RCTRootView (an UIView subclass exposed by React Native that can be embedded in any part of a native application) and load our iMessage related code on the React Native side as the bundle. 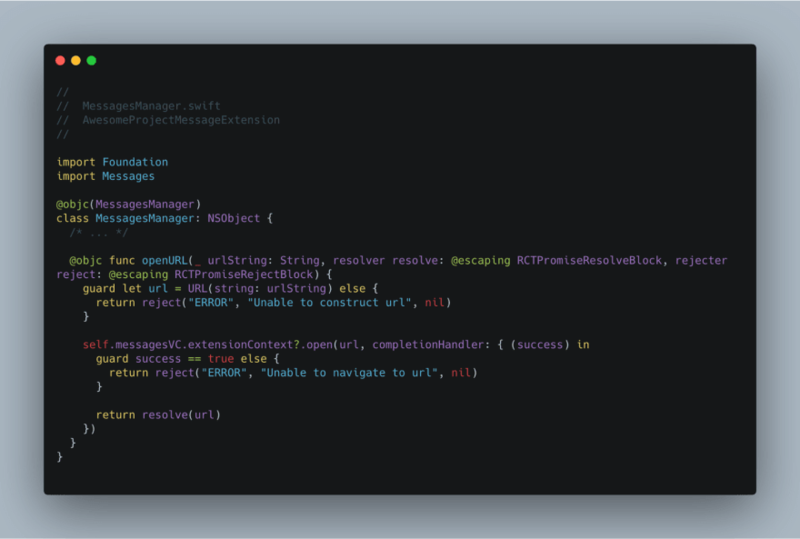 First, we start with modifying our MessagesViewController.swift to create an RCTBridge, RCTRootView and render our registered AwesomeProjectMessageExtension module within that view. Since we want to clear out everything in the screen before and after opening the iMessage extension, we also create a little helper module that does the trick for us! 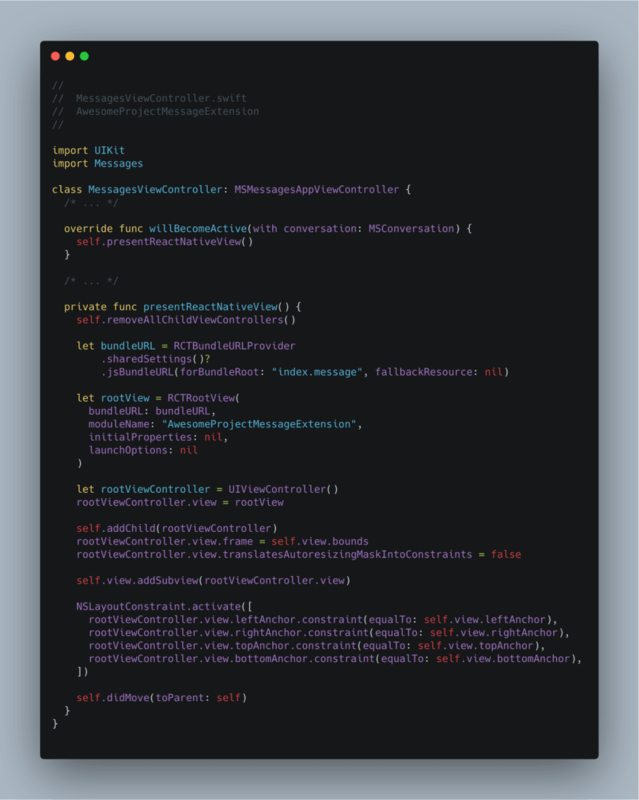 In this section, we are going to create our helpers and modules on the Swift side in order to expose the required methods and events to communicate with the React Native side. Since we are going to send data from Swift to the React Native, it would be nice to create a mapper utility for formatting that data properly. 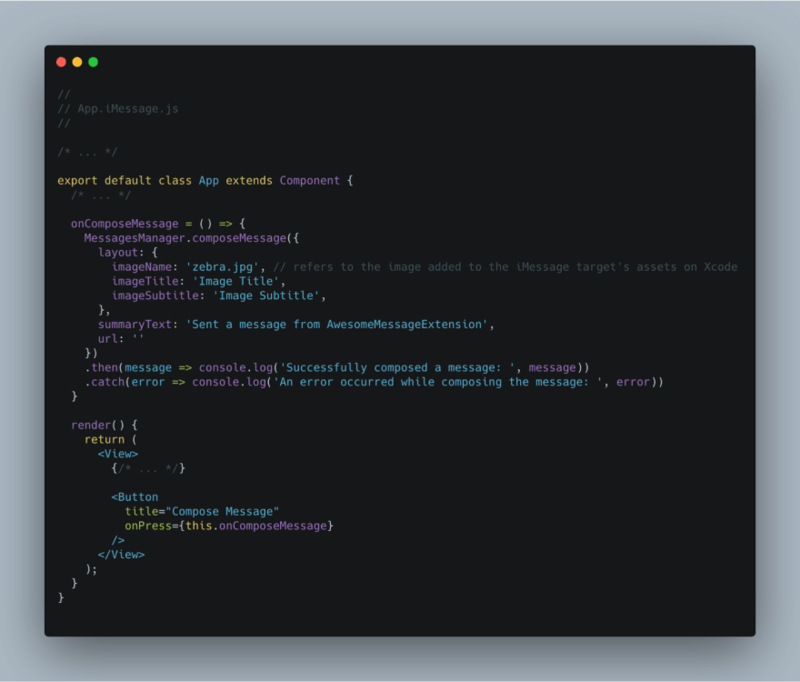 Now we are going to create a module named MessagesManager that has a connection with our main MessagesViewController and will help us to interact with from the React Native side. Based on the guidance from the official documentation we will need access to activeConversion object and presentation style as well as the methods will allow us to modify them. Since we are creating that custom class with Swift, we also need to provide the interface file to make sure it’s recognized as a native module by React Native. 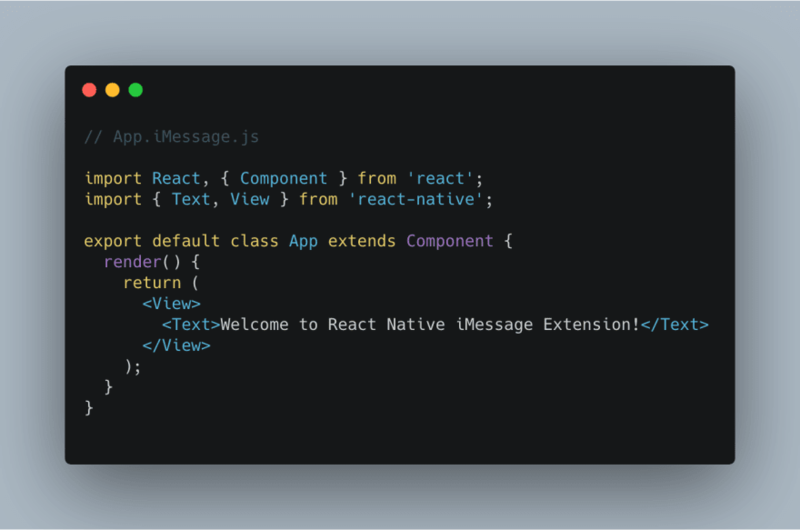 In addition to the helper methods we have provided in the previous section, now we will create another class by following the EventEmitter guide from official React Native documentation. 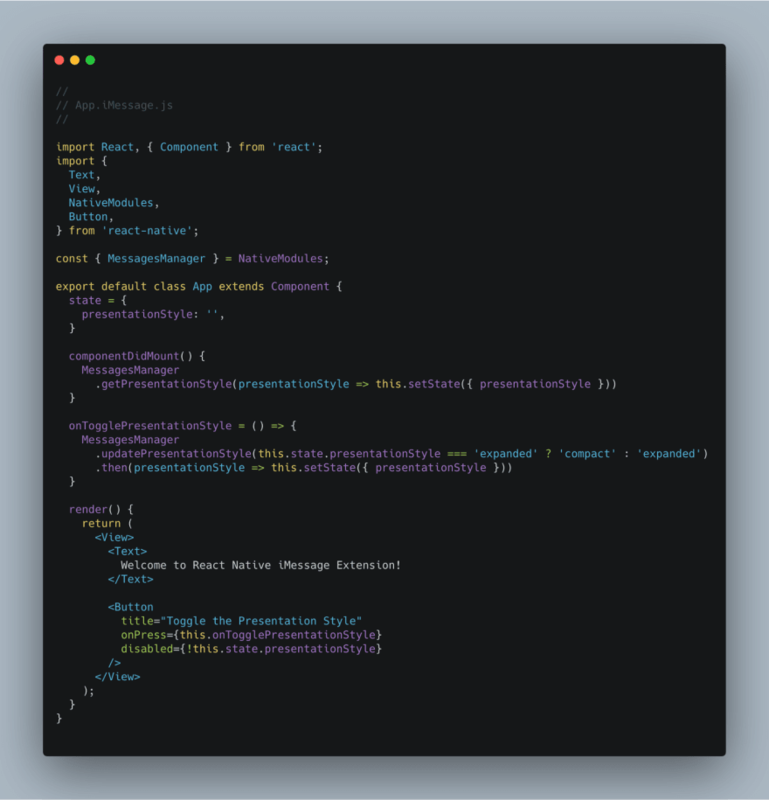 First of all, we update our MessagesViewController to define a protocol that can be easily implemented by MessagesEventEmitter to reduce the effort we need to make (and encourage separation of concerns) in order to follow an event-based design pattern. 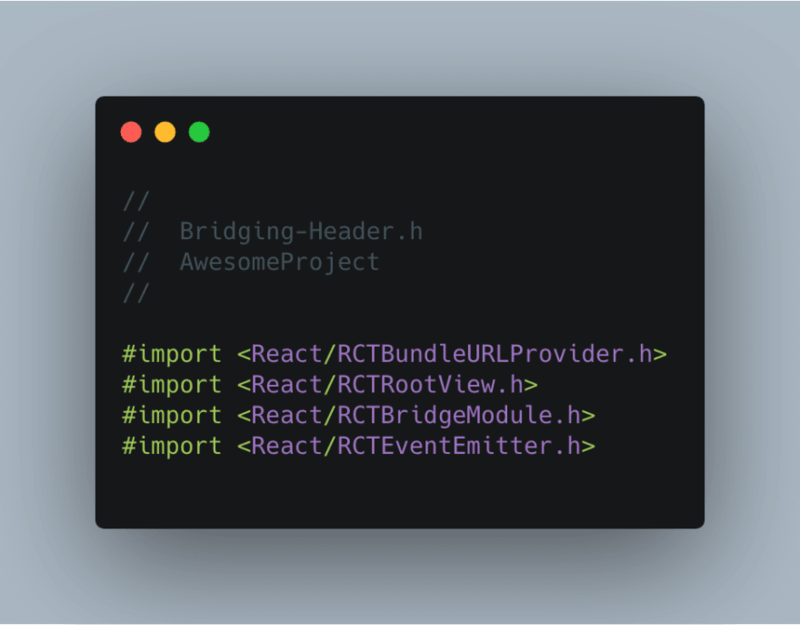 If you create a native module with React Native by following the basic flow, you’ll end up with a pre-instantiated object that is created during the initialization step of the bridge. If it was a regular iOS application, we would have a chance to communicate with the root view controller by using UIApplication’s shared property but that’s not what we were exactly looking for. 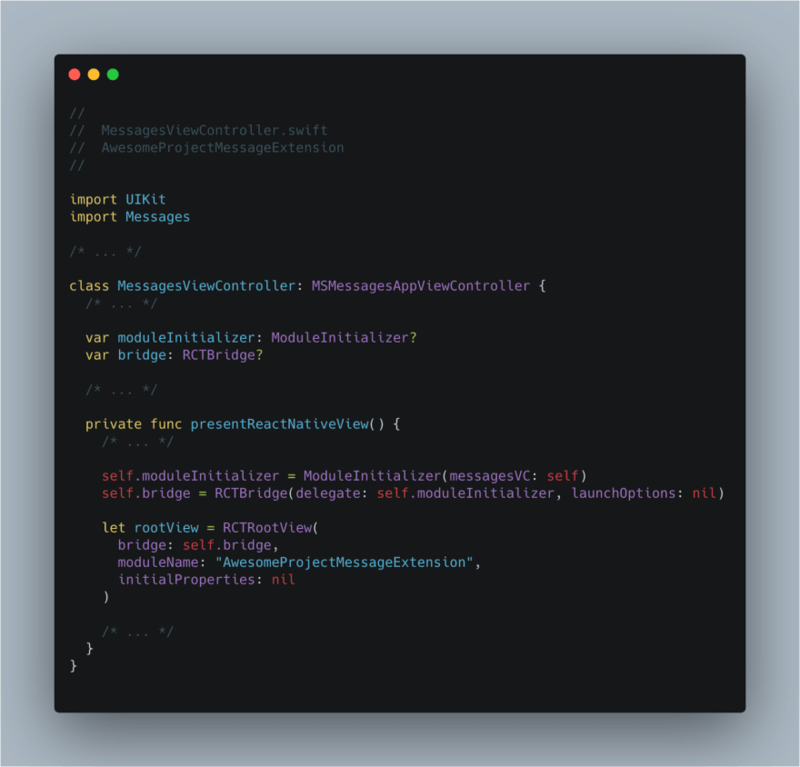 Considering that our Native Module needs to be stateful to communicate with the MessagesAppViewController instance, we ended up creating a custom module initializer by following an approach derived from the the dependency injection guide on React Native documentation. 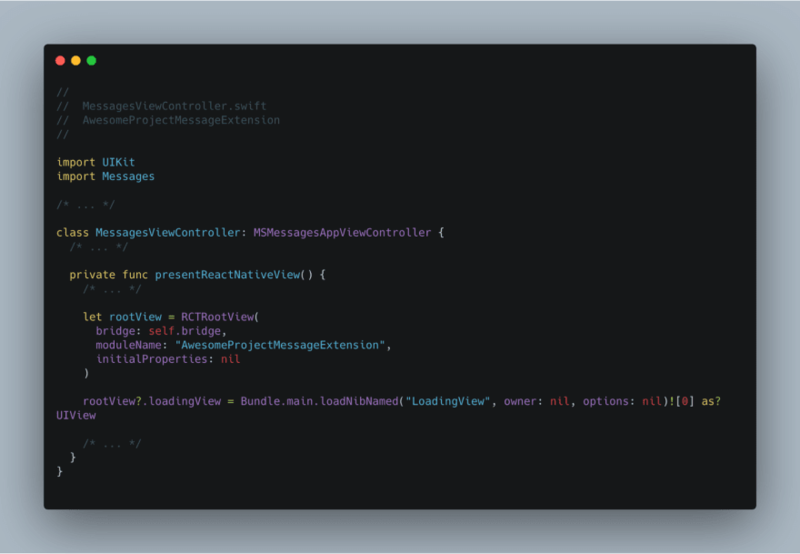 Then we will update the presentReactNative method of MessagesViewController to use that custom module initializer. 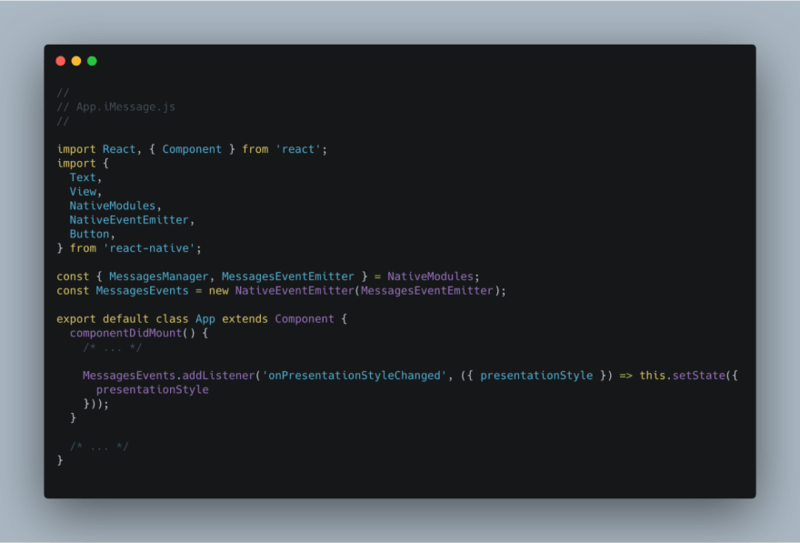 Now that we have covered pretty much all the things we need from our native modules, we can start playing with them on the React Native side. So far so good huh? But we forgot something. Let’s look at the recording below and try to catch what’s missing. Since we are not listening to the events related to the presentation style changes triggered by the native UI, we end up in a loop with the sheet continually opening, we don’t have the correct value of presentationStyle right after it’s been updated. In order to resolve this, we are going to use the MessagesEventEmitter module. 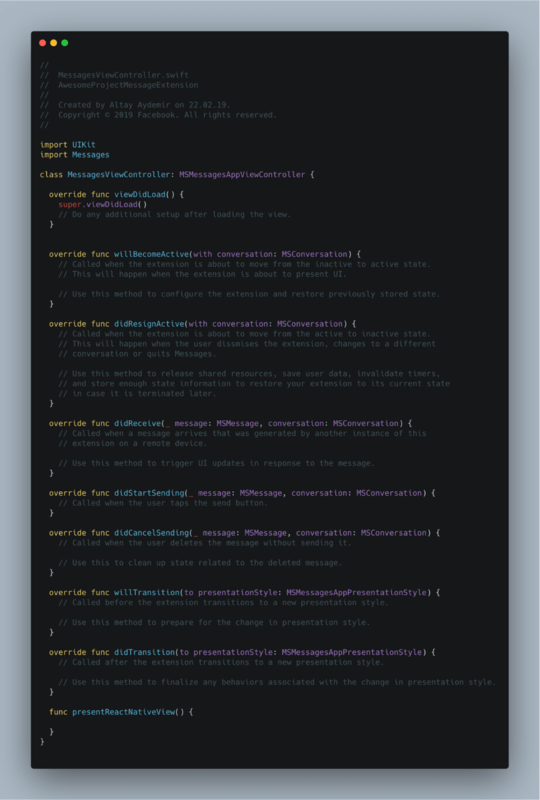 This will allow the sheet to receive updates on the state from both the native Swift environment (for when users manually close the sheet) and from within our React Native app. Now the app responds to both triggers from the codebase, and users manually close or open the sheet. 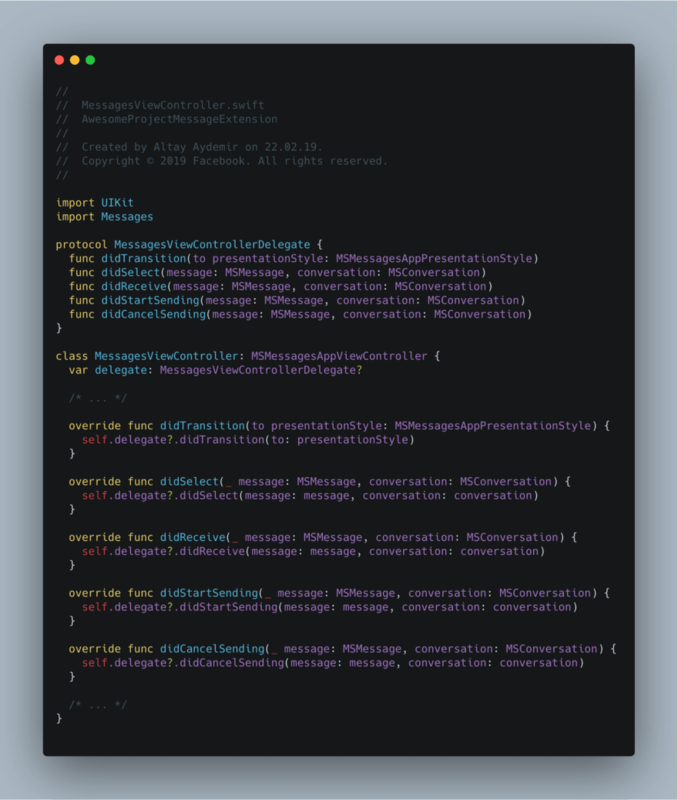 Now we are so close to our main goal, composing an iMessage from the React Native side! Let’s start with initializing our blueprint to create the data of a message object that we can through our MessagesManager module. Now that we are able to compose and send a message, we create a very simple example to demonstrate the usage of url field. What we are going to do is to put a timestamp and the identifier of the sender to the URL field and present it on the screen. We will also make use of the getActiveConversation method exposed by MessagesManager as well as the didReceiveMessage and didSelectMessage events from the MessagesEvents module. Now if we send a message as Kate to John (or vica-versa) we can observe the change in the timestamps and the sender IDs. If you want to share more data and handle complex logic, our recommendation is to use a third-party library for simplifying the URL construction and parsing logic. For a better example, you can check out the iMessage part of our open source Lisk Mobile application. When the application is run from the Xcode, there’s a crash that happens right after we go back from the message detail screen to the list screen. We haven’t found the crux of this problem but we were able to reproduce it also with the example project from Apple’s official documentation. Our workaround for the crash is to stop the Xcode right after we get everything running. 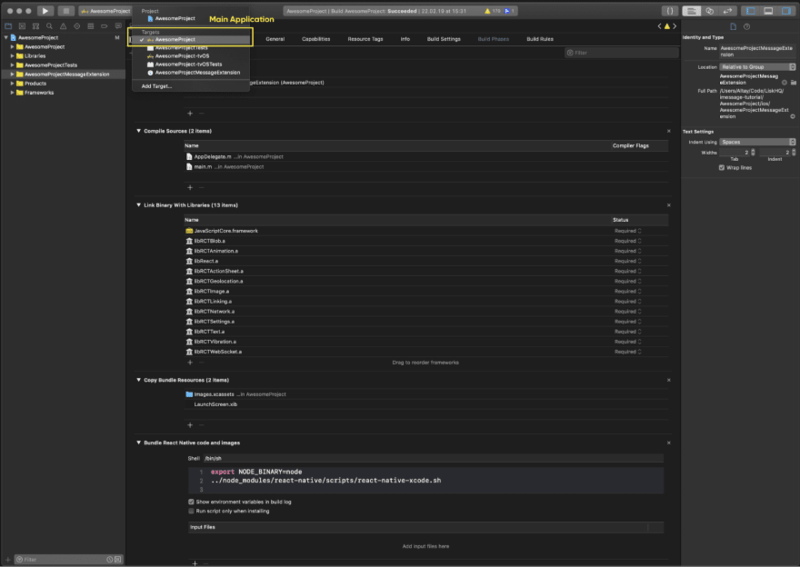 It will make more sense if you take a look at the Remote Debugger and Reload Menu for Development section below. Unfortunately, we couldn’t make our iMessage extension run successfully within a simulator that has iOS 10. The interface of the iMessage extensions has been updated when there’s a migration from iOS 10 to 11. It might be related with that update but there was not enough information for us to track the problem so we ended up choosing iOS 11 as our deployment target of the iMessage extension. While running the iMessage extension in the simulator, the participant identifiers coming from the activeConversation object of Kate and John are changed each time you compose a message. Whether it stems from a bug or a feature remains to be seen, but we had to run the application on testing devices in order to make sure our participant identifier logic worked properly. Considering the mysterious simulator crash we have mentioned in the section above, this whole experience is kind of painful for developers coming from the realm of the hot reloading with time travel. In order to improve the developer experience, we have implemented a little utility by using the DevSettings module provided by React Native. Unfortunately, DevSettings module does not export a method to get the value of liveReload and remoteDebugging flags so we need to double click the buttons within our DevMenu component to make sure we sync their state correctly. In our Lisk Mobile application, we also needed a utility for opening the main application and redirecting the user to a specific deep link. We have resolved this issue by enhancing the MessagesManager. 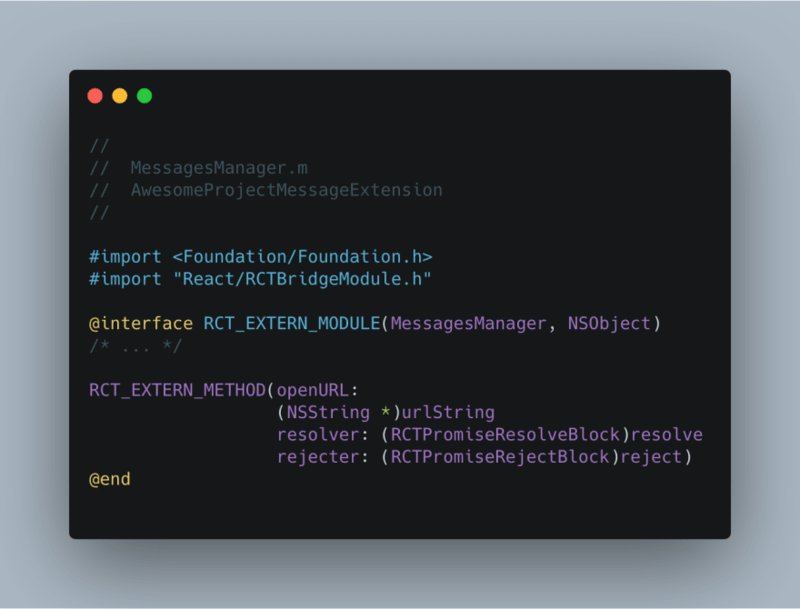 After setting up the main application to handle deep links by following the guide from official React Native documentation, next step is to update the MessagesManager to provide a utility for opening deep links. The natural behavior of iMessage extensions is to show the application logo uploaded in the assets section during the initial load as shown below. In our case, we are also waiting for React Native bundle to be loaded until we see something to interact on the screen. Luckily, RCTRootView has a property named loadingView that allows us to provide a temporary view to be shown while the bundle is loading. In order to enhance this experience, let’s create a view with the activity indicator and assign it to the loadingView property of RCTRootView. End result of this section: LoadingView is presented until the React Native bundle is loaded. Now that we have our blueprint for displaying that loading view, we can also spend a little effort to make it controllable from the React Native side. This would be very handy if there’s a case you need to delay the initial render (eg: fetching data from the server) and don’t want to deal with creating another loading view that covers full screen for such a task. presentReactNative method initializes and presents a LoadingView on top of the RCTRootView, instead of using the RCTRootView.loadingView property. Updated interface file of the MessagesManager to contain methods for controlling the loadingView. Now it’s time to make use of those freshly added methods in the React Native side. What we are going to do is to fake an asynchronous task in componentDidMount and delay the initial rendering of the content until that task is completed. We will also add an additional button to the sample set to toggle the loading screen again. Working on user-facing applications in an insular software environment such as that of Apple requires innovative solutions. 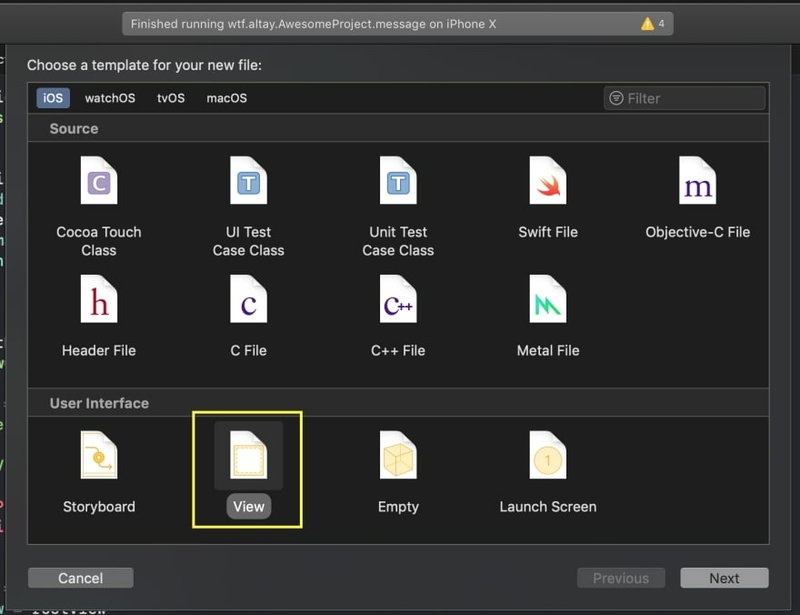 While Apple definitely provides comprehensive documentation aimed at helping developers coding with native iOS, connecting the existing pieces to the native ecosystem is another thing altogether. After deciding to implement iMessage extension for the React Native-based Lisk Mobile, we experienced this obstacle first hand. 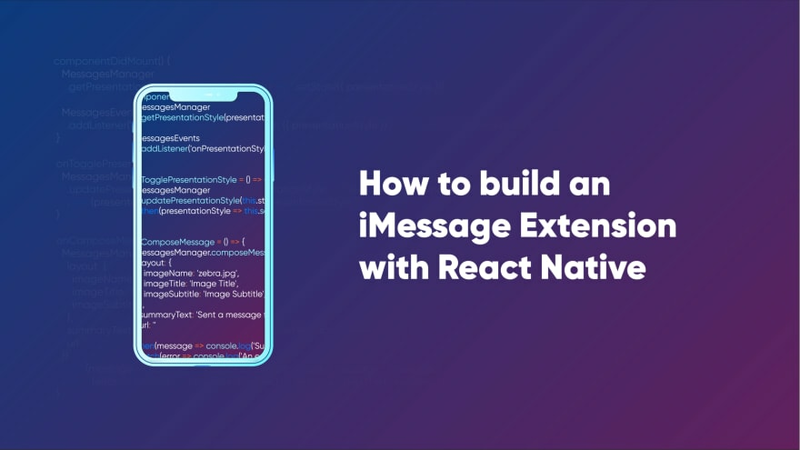 Nonetheless, we found writing a bridge between React Native and the native iOS-based app an exciting and educational experience. 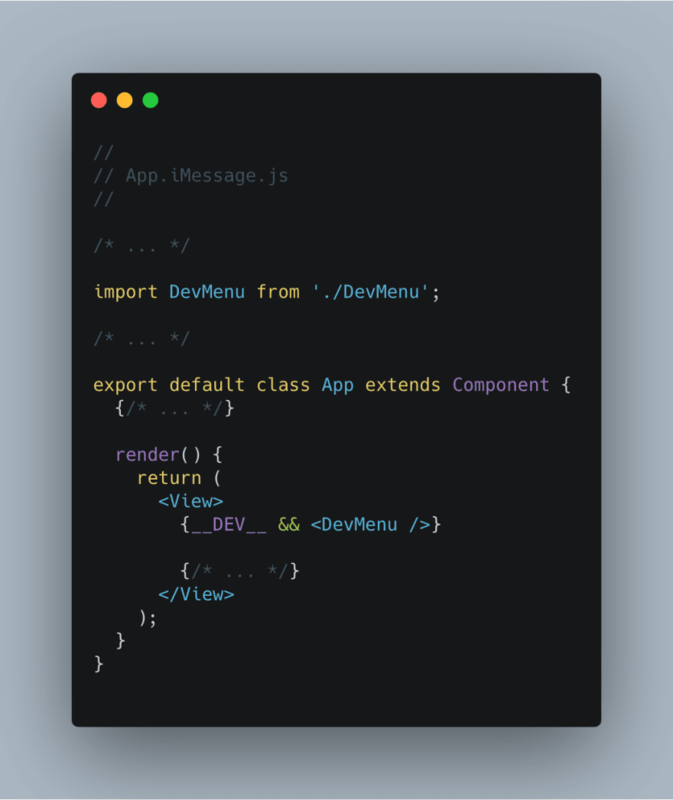 We hope this tutorial will save you time in implementing a similar feature to your React Native application as well! I am a software developer mostly working on client-side applications. I like exploring new technologies.